So, I keep hearing Karen talk about this show that she watched last season, on Network TV, that just rips her heart out and bawl every week. Apparently it is a real tear jerker of a show, yet she can't seem to get enough of it. 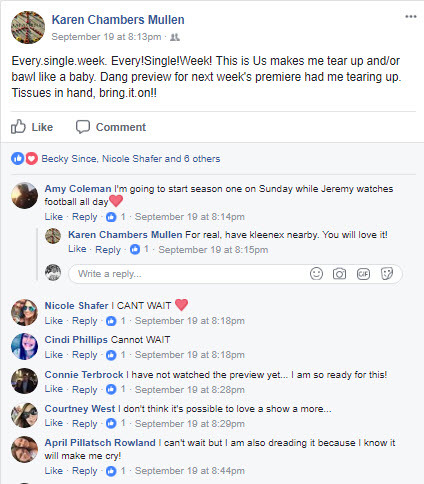 Apparently, last night, a trailer teasing of the first episode of season 2 popped up during a commercial break on the show she was watching; and even just the trailer got the tears to flowing. She posted the following on her facebook wall, and the comment section blew up with comments. I have to admit that I normally do not like most of the programming choices that Karen chooses to watch on TV. In fact, I hate most of the shows that she prefers to watch, and some of the shows she watches outright disgusts me and assaults my very moral core. Some of those shows should never have even made it to production, much less ever being aired on TV or Cable. But, that's a completely different issue, and way off point from what I am trying to express here. So.... On my break time this morning, I Googled this show that she watches: THIS IS US. I tried to find it on Netflix, or Amazon Prime. No luck. However, since we are SPECTRUM cable subscribers, I am able to watch the show via the NBC app on my phone. Not the best format for trying to binge watch a TV show with commercials. I think I have figured out how to watch on my laptop as well. Also WITH commercials. This is going to be a real challenge. I have less than 6 days to get through and watch 18 episodes in order to complete all of Season 1, before Season 2 starts up on SEP 26th. If this were NETFLIX, that wouldn't really be such a monumental feat. that would only be 3 episodes per night, at roughly 42 minutes per episode. I've managed that level of Binge before. But, with watching each episode via the NBC app, or even on the NBC website, you are stuck watching all of the regularly scheduled commercial breaks, as well as the random commercial breaks that just pop up as a glitch in the website. that makes each episode take about an hour and 10 minutes each (give or take an extra 10 minutes every now and then). But that is what I'm going to have to do if I want to start watching the show WITH Karen on Tuesday nights at 8 PM. Tomorrow,... Thursday night is out. I have a Cub Scout Pack meeting. Friday night will most likely be date night. So, I'm going to have to figure out how to fit 9 episodes in on Saturday (unless I stay up late Friday night and sleep in Saturday). I'm already 3 episodes in for today. One during my break times at work on my phone, and two since I got home. I have to admit that the show is not too bad, so far. I don't exactly love it, but I don't hate it either. It's intriguingly good,... so far. Although I have to admit that I don't get the tear jerker aspect of it. I'm typically pretty in touch with my emotional side, and am willing to let a show lead me to tears if it warrants the emotion. three episodes in, and I haven't shed a tear yet. the show is emotionally engaging, but not to the tears and tissue level that I've heard of. Either way, I'm going to give this a try. The show seems to avoid political sway, and hasn't shown signs of trying to pander to any social justice agenda. I just hope this doesn't come back to bite me. I'm going to have to invest some late night hours, and time to catching up on Season 1. The last time (OK, multiple times) I tried to put this kind of time into something to share with Karen, she chose to either go ahead and watch the shows on her won time without me, or in the case of last February, went and saw the movie without me. maybe I'm a glutton for punishment, but I'm willing to give this another try. I just hope that she is pleasantly surprised when I sit down to watch Season 2 of THIS IS US with her next Tuesday, and I am up to date on all of the characters and story arcs. Here's wishing myself luck. My Bubbie is worth it.